Ireland coach Declan Kidney has played down questions about his future in the job ahead of the Six Nations. Kidney's Ireland contract expires in the summer and he may need his team to deliver a strong Six Nations performance for him to retain the job. 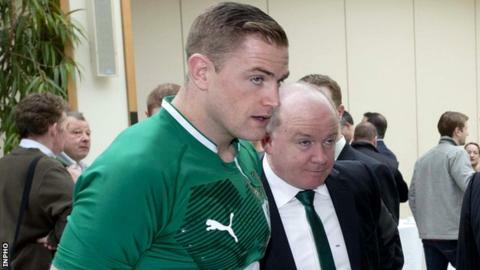 "There haven't been any discussions with the Irish Rugby Football Union, what will happen will happen," he said. "My tomorrow is just about getting ready for our opening Six Nations match against Wales." Kidney added: "I'm just going to enjoy the now. To have the privilege of coaching Ireland this year is a huge honour for me and one that I take really seriously." The Ireland coach has made one of the biggest calls of his Ireland stewardship after selecting Jamie Heaslip as captain ahead of Brian O'Driscoll, who has been the automatic selection since 2004. O'Driscoll has played only three matches since undergoing ankle surgery in November and will start against Wales in Cardiff on Saturday week. Kidney has said his decision will enable O'Driscoll, a contender to lead the Lions tour to Australia this summer, to focus on himself. "It was my decision to give Brian a bit of space that he himself didn't want just to get himself right," Kidney said. "Brian reacted to the decision like the man he is and took it in exactly the same way as he plays." O'Driscoll was disappointed by his demotion, but has assured Heaslip that he has his full support.